I've just got hold of a copy of Run Fast. Eat Slow: Nourishing Recipes for Athletes. I wouldn't call myself an athlete, especially not when this book is written by Shalane Flanagan and Elyse Kopecky, but I'm more than happy to aspire in that direction for the purposes of baking (and maybe some actual cooking). You can see a quick flick through the book here and I'm going to be trying out some of the recipes from this book over the coming months. First up - Sweet Potato Breakfast Cookies. Don't be fooled by the worthy-sounding-ness of this recipe for raw vegan carrot cake. It's good. Containing 20g protein and with quite technical-looking packaging, these are aimed firmly at the gym-sports heavy training market. I don't usually buy protein bars, preferring to opt for an apples & PB combo but I was pleasantly surprised by these. If you ignore the chocolate coating they taste a lot like some of the raw cacao and date bars and are not too sweet either. They are more of a dense bar with some oats for texture than a true flapjack. Also good dunked in coffee. I wouldn't say this kind of bar should take the place of good, normal food but as a quick post-training fix it's useful. I had one in the car on the way to a race because my normal porridge-in-a-pot was not an option (note to self - holiday cottages do not have tuppaware). 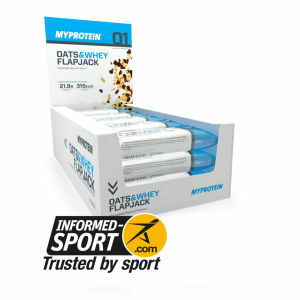 I won these MyProtein oats and whey chocolate flapjack thanks to Running Heroes so did not pay for them. I wasn't asked to write about them.